New outboard motor commissioned Saturday 13th April and works a treat. Match Secretary Adie Baker has now been promoted to Captain! We have a couple of on-going projects at the moment and are very busy trying to complete asap. 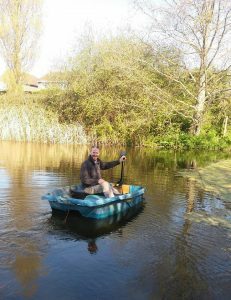 We want to really control the heavy weed growth on the river this year and have purchased an outboard electric motor and a suitable battery, we are also on the look out for a boat. This equipment will enable us to access the weed and bring it to shore for disposal. We are also trying out a new weed rake to use in conjunction with the boat. Work is also very much in progress to place platforms on certain pegs but there are a number of hoops we have to jump through in order to obtain permission as well as applying for funding to assist with the costs. Updates on progress to follow. Chris Ford had the best roach of the season on the last day from peg 34. It was witnessed and weighed on Club scales and registered 2lbs 14oz, Chris also had a number of other specimens. A 3lb er is surely on the cards for next season. 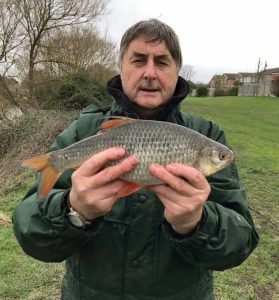 The river season is almost at an end but anglers targeting the River Kenn above Strode Rd in the last few days have been rewarded with some fantastic specimens. 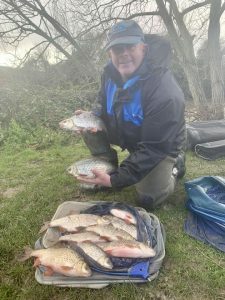 Roger Thayer had one 2lbs 2oz and Committee Member Scott Smallwood had a personal best at 2lb 8oz along with other quality fish on the straight lead and bread. 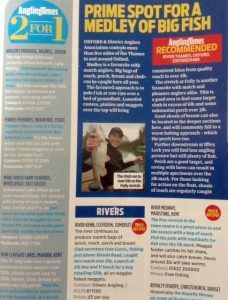 Angling Times has assisted in promoting the Club for the 2nd Time this year. 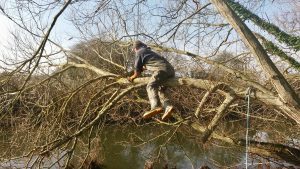 Match on the River Kenn (3rd March) was tough with most of the fish in the first 5 pegs above Strode Rd bridge . 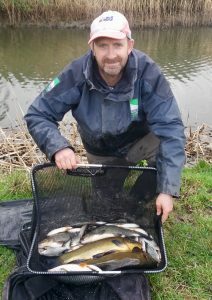 Match Secretary Adie Baker drew peg 36 and had 2 decent tench along with lots of stamp roach. 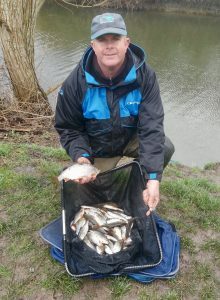 Below him on 35 Scott Smallwood had a nice roach bag for 2nd place. 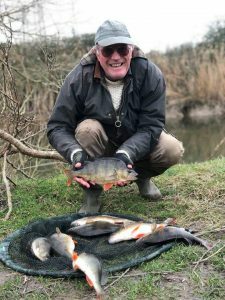 Not far behind and in 3rd place was Head Water Baliff John Sallis who from peg 37 had some quality hybrids a tench, a big perch and some roach. 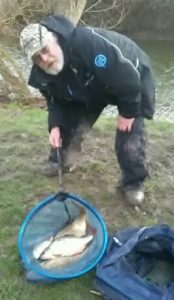 Sam Johnson had a 2lb 14oz chub and a 2lb 8oz perch in his bag from peg 34. 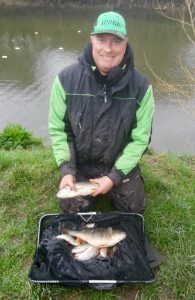 The bottom section was won by Tim Nix with a single 2lb 12oz tench. 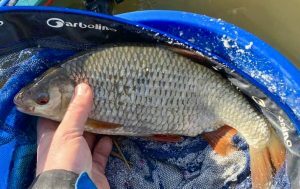 C Section anglers, pegs 38 – 41 did not have a bite! Nice to see some roach showing. 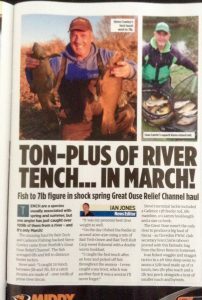 Although there have been some great bags of fish on the Kenn since the beginning of the year some anglers have also blanked. A lot of anglers have been targeting the pegs above Strode Rd Bridge. 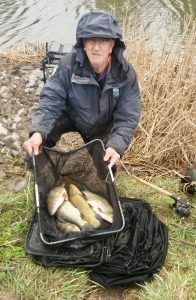 Chris Ford had a day below the bridge this week on peg 22 and was rewarded with a nice bag of tench which indicates they are all the way through the lower river if you are prepared to have a go. 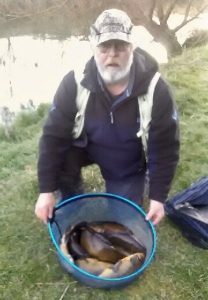 Richard Blinman returned to the River again this week after catching some nice tench the previous weekend. He didn’t have any tench this time but was equally happy with these perch, the best going 2lb 9oz. We have completed the final bit of tree management above Strode Rd Bridge and cleared 2 bags of litter from in and around the pegs. 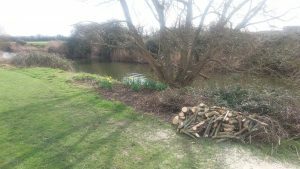 Work will continue with weed and reed management as they start to grow and appear in the Spring. 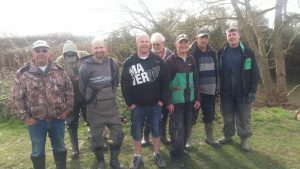 The match on the River Kenn on Sunday 3rd March is now an Open. Good effort this morning opening up some swims a bit more above Strode Rd. Bridge. Next Saturday 2nd March will see some more time and effort put in to finish them off as well as a general tidy up. We will also be doing a litter pick. If you can give an hour or two it would be most appreciated. Meet at Strode Rd. Bridge 09:30.